The International Cricket Council (ICC) has fined Bangladesh all-rounder Shakib Al Hasan and Afghanistan’s Dawlat Zadran half of their match fees for misconduct by making deliberate physical contact during ICC World Twenty20 opener. 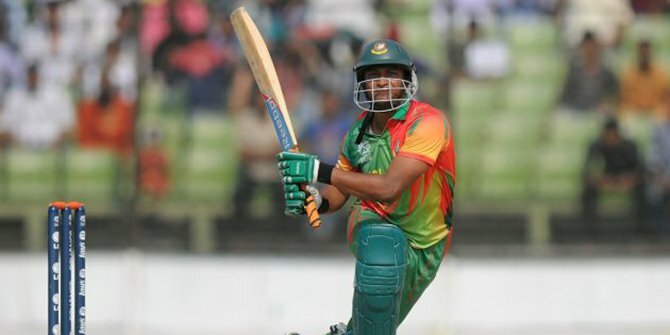 The incident happened in the ninth over of Bangladesh’s innings when Dawlat, in his follow through, made deliberate physical contact with Shakib, who, in turn reacted and made physical contact with the bowler at Sher-e-Bangla National Stadium in Mirpur on Sunday. In a press release published on its website the international cricket authority says both players were found to have breached Article 2.2.4 of the ICC Code of Conduct for Players and Player Support Personnel, which relates to “inappropriate and deliberate physical contact between Players in the course of play during an International Match”. The charges were laid by on-field umpires Richard Illingworth and Nigel Llong, third umpire Kumar Dharmasena and fourth umpire Richard Kettleborough, all from the Emirates Elite Panel of ICC Umpires. The incident happened in the ninth over of Bangladesh’s innings when Dawlat, in his follow through, made deliberate physical contact with Shakib, who, in turn reacted and made physical contact with the bowler. Both Shakib and Dawlat pleaded guilty to the charges and as such, under the provisions of the Code, the matter was determined by Ranjan Madugalle of the Emirates Elite Panel of ICC Match Referees and so there was no requirement for a full hearing. All Level 2 breaches carry a minimum penalty of a minimum fine of 50 percent of applicable Match Fee and/or up to two (2) Suspension Points.